Why would the United States federal government give scientists $1,000,000 USD to establish centers for the control of Black and Latino youth? Was it to help them become leaders in their communities and the society at large? Was it to ensure they could avoid the traps of selling drugs and dropping out of school? 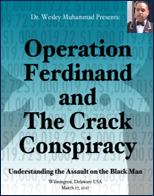 Dr. Wesley Muhammad presents an exposé about "Operation Ferdinand" and how this covert program which started in the 1960's continues through today. Delivered at Muhammad Mosque No. 35 on March 17, 2017. The slides from the presentation are included as a PDF file.